Ok, so I’m putting my money on the fact that most of you batmaniacs out there have seen this already but I’m going to imbed it anyway. My father and I were really impressed when we first saw these Batman Onstar commercials. The production values and the look of all the actors was superb. One of the best aspects of these commercials is that they use the Michael Keaton style of the costume and the ’89/’92 film version of the Batmobile. I’ve been watching this video probably since the user uploaded it! The video links all 6 commercials together to make a mini Batman Onstar movie! Check out the Riddler! I already covered Batman birthday cakes so far in the Dark Knight Countdown so now let me backtrack to the invitation. 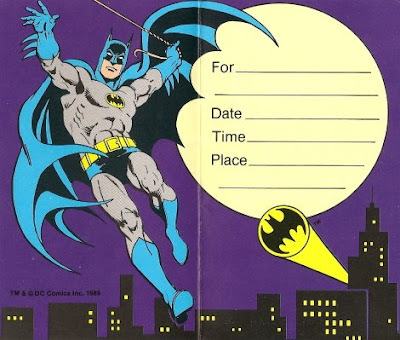 This is a Batman party invitation from 1989 which I kept as part of my collection. This is the comic book version of Batman who I grew up with. I always loved this version of Batman the best especially since I was introduced to him way before the Tim Burton version was even thought of. 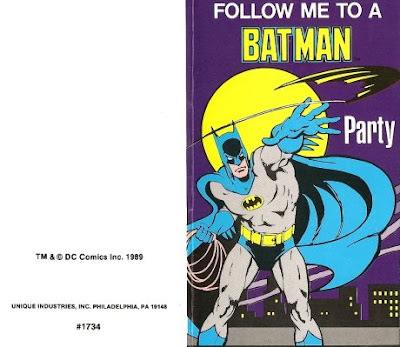 All throughout Batmania of the late ’80s and early ’90s this was still the “go-to” Batman who appeared on everything from t-shirts to party plates to puffy stickers. Forget about continuity, Batman wore gray and blue in the comics and black whenever he was on the big screen. 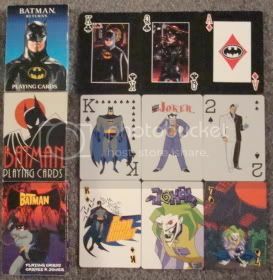 In my Christmas stocking for a few years I found sets of Batman playing cards. I used to think that since I wasn’t a big card player except for my big win in the “Go Fish Tournament of Champions” in ’86 that these cards were pretty useless to me. Considering almost every other thing in my room is Batman related these playing cards probably felt terribly neglected. You would think because these were such badass card sets that It would’ve made me want to play more cards, right? Well, that wasn’t the case. Recently I came to terms with these cards and realized that they are merely an addition to my Batman collection. If I were to play cards, let’s say, on my converting gaming bar that I never use, I highly doubt I’d whip these babies out for everyone to get their slimy hands on. Yeah right! Don’t underestimate my analness! I’m much more paranoid about my collectibles than that. Of course I have a regular set to play with that are NOT Batman, so relax! For some reason it seems that every set of Batman playing cards was top quality. The cards were glossy and weren’t thin and flimsy like alot of card sets. The Animated Series set was by far the best because all of the cards featured almost the entire cast of characters in the show. The more recent “The Batman” card set runs a close second since every card has artwork from the show, but not enough of Batman’s rogue’s gallery! The Batman Returns set only featured photos on the face cards so that was a bummer. The Joker card in the Batman Returns set wasn’t even Joker since he wasn’t in the movie, so they slapped one of the skeletal members of the Red Circus Gang on the front of it. I don’t own the card sets for the other films but judging by these cards, I’m sure they were well done also. My dream playing card set would include Ace the Bat Hound on the ACE card, Matches Malone on the JACK card, King Tut on the KING card, and Marcia Queen of Diamonds on the Queen card. Who would you pick to be featured on your set?